A week ago, life was just tonking along as usual. Saturday had arrived and despite it being winter, it was fine and sunny with enough wind to get the laundry dry. Sunday was looking similar. I nearly suggested to my husband that if the weather was good on Sunday, we should go for a drive, perhaps to have lunch at a local brewery or winery and enjoy the cooler weather and the green countryside. Well, Sunday came and the weather didn’t look so good and the forecast wasn’t good either. As the day wore on, the forecast was for stronger and stronger winds, the sky got gloomier, the rain squalls started, and by early afternoon a pretty big storm had set in. 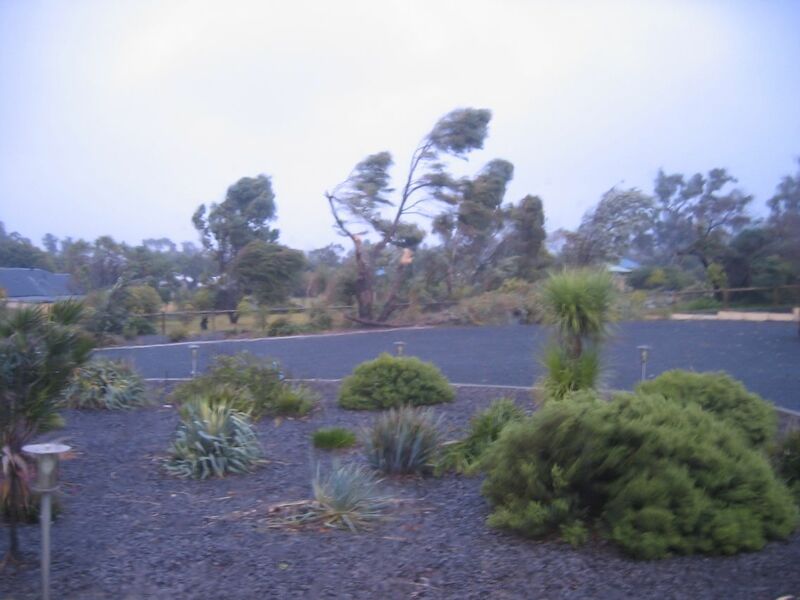 I was in my sewing room watching the winds whip at the big Tuart tree out the back — the winds were from the north-east. Not long after I looked up again and saw that the winds were howling in from the west. The power fluctuated and then went out (~2:10 pm), so I left the sewing room to deal with the computers. They are all on UPSs but that storm was really raging so I figured it would be prudent to shut them all down anyway, including the server. We were being hammered with howling winds and driving rain. After I’d shut down the computers and turned off the UPSs, I went back to the sewing room to turn off my sewing machine and iron (just in case the power came back on and I forgot them!). I glanced out the window to try to gauge the strength of those winds and saw that three huge branches off the Tuart tree were now on the ground! Those limbs had circumferences bigger than a man’s thigh. I couldn’t tell if they fallen on and broken the back fence — and I sure wasn’t going to go outside to look. After this nasty storm had passed (it was about 90 minutes of banshee howling winds and horizontal rain… and no power — not a 90 minute period I’d ever want to experience again as it sounded like jumbo jets were about to land on our metal roof), it calmed down to a dull roar and I went outside to assess the damage. The house looked like it had come through unscathed, thank goodness. 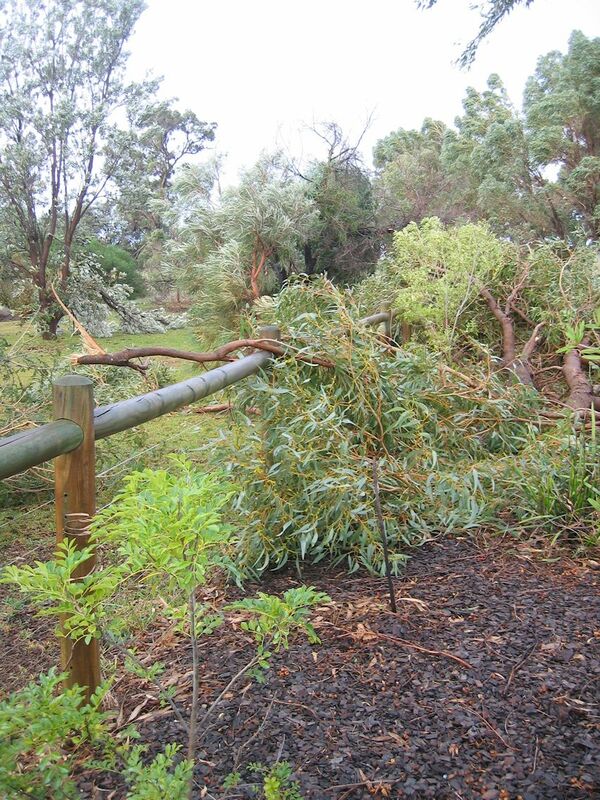 However, the Tuart tree branches had snapped like matchsticks. The branches had landed parallel to the back fence, and I still don’t know whether the fence has been damaged (the tree loppers come tomorrow and until they clear the branches and the associated masses of leaves, I won’t know if we can claim the tree removal on insurance — it seems I can claim it if the fence has been damaged, but not if it hasn’t). We still didn’t have power, and when I tried to call Western Power on the landline, I found we didn’t have landline either (copper connection). Mobile reception was almost non-existent too. I was able to get a couple of text messages out and receive a couple, but couldn’t make or receive calls or access the internet from my phone. We were stranded. 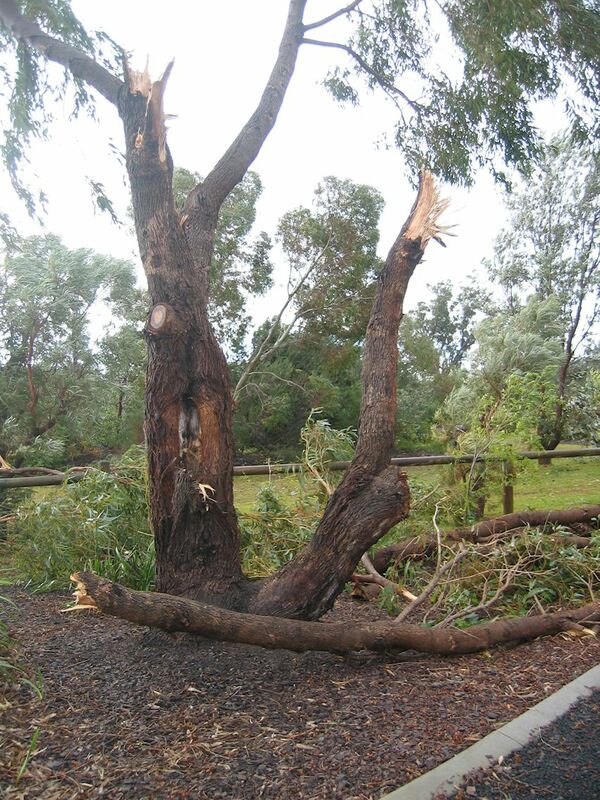 Had a roof lifted or blown off, I had no way of contacting the SES or 000 for assistance. That was a worry. We went to bed early on Sunday night — with no power and with it being winter, there wasn’t really any other option. Our house is all electric, so we had no way of cooking a meal (cold meat and salad sandwiches for dinner!). We don’t have a gas BBQ as summertime (when we’d most likely use a BBQ) is the time for mosquitoes carrying the Ross River Virus and we don’t want that! (we live close to an estuary where Ross River Virus-carrying mosquitoes live). Our hot water system is an electric storage one with a big tank, so as we didn’t know when the power would be restored, we had short showers or ‘duck splashes’ to conserve as much hot water as possible. Batteries for torches were becoming an issue — we had a couple of spares, but they wouldn’t last long if we were without power for several days as was predicted (we found the battery-operated transistor radio, so we could hear what was going on in our region). It was still windy on Sunday night, so I hunted out my Qantas ear plugs and put them in to minimise the noise so I could sleep. I woke up several times during the night checking to see if the power was back on. It wasn’t. On Monday we awoke to no power. It was still wild and woolly outside but the need to find phone reception to let my family know we were OK was becoming critical as was another source of light than just small torches. I heard on the radio that our closest shopping centre (some 8.5 km away) had power and was open, so I decided to take advantage of a short break in the weather and head there to make calls, and stock up on some supplies — after figuring out how to manually lift the automatic garage door. I figured that Cathedral Ave, the road that hugs the estuary, would likely be out of action as a result of storm surges, high tides, or fallen trees, so I went via the highway. In the 2 km to get to the highway, I came across road crews clearing a massive tree that had fallen across Cathedral Ave. It was a white-knuckle drive into town — the wind was still really strong and there were bits of trees, whole branches, and entire trees down and blowing around. At the shopping centre, I was able to get a wind-up LED torch (no reliance on batteries, which was just as well because the were no torch batteries or candles to be found), send a couple of texts (I couldn’t make or receive calls though or access the internet), and some food supplies, then made the hair-raising drive back home. I was glad to be back in one piece. Still no power. We played euchre, Scrabble, Jokers and Marbles, and I hand-stitched the binding on a quilt I’d finished making on Sunday before the power went out. We listened to the transistor radio, and I turned off my phone to conserve battery power (earlier in the day I had started the car in the garage to recharge the phone battery). Meantime, the weather still howled around us, with the occasional break. We heard that some 170,000 homes were without power across the south-west. Assuming two people per house, that’s some 340,000 people (out of a population of 2 million) without power… about 1/6 of the state’s population. I’d had some cabling guys scheduled to come on Monday to rearrange the server and PCs in the office, and they turned up. They got to work — in the dark, with torches. But of course, they couldn’t test anything without power. So they left around 4 pm, intending to come back in the morning, when we hoped that the power might be back on. We had cold meat and salad sandwiches for dinner again on Monday night, and no showers. And I had to toss out the entire perishable contents of our deep freeze and two fridge/freezers. Even though we’d been without power for nearly 30 hours at that stage and it was winter, the frozen foods were starting to defrost. We went to bed about 6 pm (it had already been dark for more than an hour and we didn’t want to waste battery power unnecessarily). I put my ear plugs in again to minimise the drumming of the wind on the bedroom windows at the front of the house, so I didn’t hear the beeps of the UPSs starting up when the power finally came back on at 9:30 pm Monday night, some 31.25 hours after it went out on Sunday afternoon. My husband woke me up and we made sure that everything that could be recharged was set to do so (security alarm system, phone batteries, UPSs, and the hot water system was back on). There was no point turning on the PCs or server as the recabling still wasn’t complete. Besides, we didn’t know how long the power would stay on for. Tuesday morning was the calm before the next storm. We still had power, so everything was recharged — and we had hot water for a shower! The cabling guys came bright and early and finished the job and we were able to test that everything worked fine. I was able to get some text messages to my main client to say I couldn’t work on Tuesday and Wednesday was doubtful if the storms were as bad as Sunday, as was expected. We had a lot of running around to do… Several plants had fallen over in the first storm and needed to be staked to save them, so we needed to get into Bunbury to get star pickets and other stuff to stake the small trees with, we needed to get torch batteries and hopefully a lantern of some sort. I figured that the usual places would be all sold out of batteries, so we went to the Bunbury Cash and Carry (I’m a member) where we found torch batteries and the last battery-operated fluoro lantern they had! Bunnings had run out of batteries the day before, as we found out when we went there to get the star pickets etc. And we saw several people buying generators (yes, we will get a generator too — I don’t want to have to go through 31+ hours of no power or communication access again, ever). I also needed to call my insurance broker and start the process of insurance claims (the landline and mobile came back after the power was restored on Monday night). 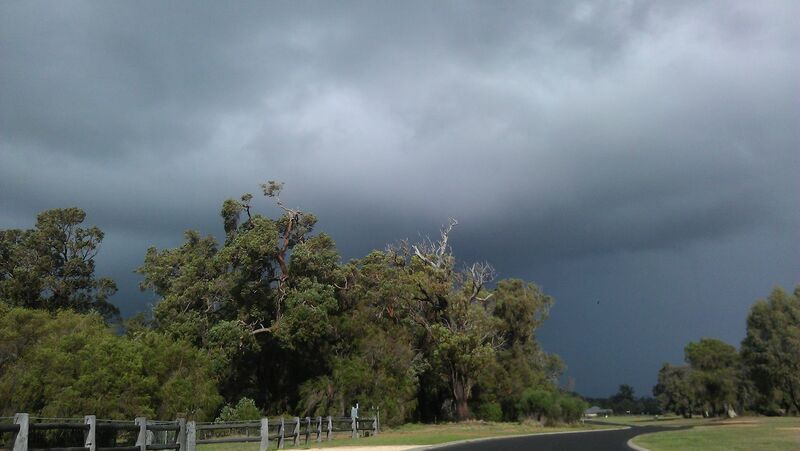 This was some 6 hours before the next big storm was due to hit…. Just when we assumed we’d be in for another power-less night, the power came back on, some 2.5 hours after it had gone out. I quickly cooked dinner long before our normal dinner time, as I didn’t know if we’d have power through the night (we did, thankfully). We settled in front of the TV, fully expecting the power to go out at any time. Meantime, the weather forecast of the storm crossing our area of the coast around 8 pm was spot on — the wind was absolutely howling (squealing like a banshee!) and the rain was drumming heavily on the metal roof, drowning out the TV. It kept up like this for an hour or so, then died down for a bit, then started up again just before we went to bed. Scary stuff. My ear plugs got another workout! But we didn’t lose power overnight. I was dreading what we would find next morning as I fully expected the Bali hut to blow over. Surprisingly it was intact, though it may have leaned back another degree or so. By Wednesday mid-morning, except for the evidence of destruction, you wouldn’t have known about the ferocity of the past 3 days — the wind had calmed right down, the sky was clear, and it was a gorgeous day. We had power, landline phone, mobile, and internet connection and all was good. However, nearly a week after the worst storms in the area for decades there are still some homes without power. I feel for them — our 31+ hours without power wasn’t something I’d like to repeat, so I can’t imagine how they are coping after six days. Underground power doesn’t mean you’ll be immune from extended power outages. Presumably something went down further down our line, thus preventing all power into our estate, which has underground power. Until ALL the power lines are underground, trees falling on power lines, or power poles blowing over will be an issue. You can’t rely on landline phones for communication. We heard from one of the cabling guys that because we live 8+ km from the exchange and are therefore on a RIM exchange, it’s got a battery backup and when the power goes out for an extended period of time, the backup fails too. You can’t rely on mobile phones for communication. Like the RIM exchanges, if the mobile towers lose power and battery backup, they won’t be of any use until someone gets a generator to them. The SES and other volunteers that helped out families who had lost roofs etc. in this storm were just AMAZING. They risked their own lives in some of the most inclement weather to help out others. The Western Power, FESA, telecommunications etc. workers who got the infrastructure working again in the most inclement conditions were equally as AMAZING. They had to work in truly dangerous conditions, with live wires sparking around them. ABC Radio Southwest was an absolute lifeline for information about the storm, its aftermath and what services were up or not. While we couldn’t contact the outside world, we could hear about what was happening elsewhere via ABC Radio. The messages they broadcast were timely, accurate, and made you feel like you weren’t alone. The infrastructure couldn’t cope. There’s something wrong with the construction and maintenance of the infrastructure when whole estates, suburbs, towns etc. are without power and telecommunications for days, not hours. Cost-cutting over many years and lack of will (political?) to invest in infrastructure has led to the delay of programs such as underground power, timely replacement of power poles, etc. We will be getting a petrol-powered generator. Not this week, but soon, once I find out more about them and what will be best for our needs. I never want to be without power for that long again, not in an all-electric house. Solar panels would’ve have made no difference. We have thought about getting solar panels, but until there’s an effective and affordable option for battery backup/storage or for such a system to provide your own house with power before it supplies the grid, I can’t see us doing it. Had we had solar panels, they wouldn’t have made the slightest bit of difference as our power still would’ve been subject to the vagaries of the grid. Finding out how to contact emergency services for assistance when you have no telecommunications is a priority. Without landline or mobile communications, had we been in a situation where we needed help, we had no way of letting anyone know. And driving in such a storm — assuming we knew where to drive to for help — would’ve been too dangerous. Our lungs aren’t looking forward to the next few months as property owners burn off storm debris. I can pretty much guarantee that every fine day between now and late spring will be smoky as property owners burn off the fallen branches etc. from these storms. Our tree branches will be mulched by a wood chipper — short-term noise, but no smoke. If there was some other way that property owners could deal with their green waste, maybe they wouldn’t be tempted to burn off. 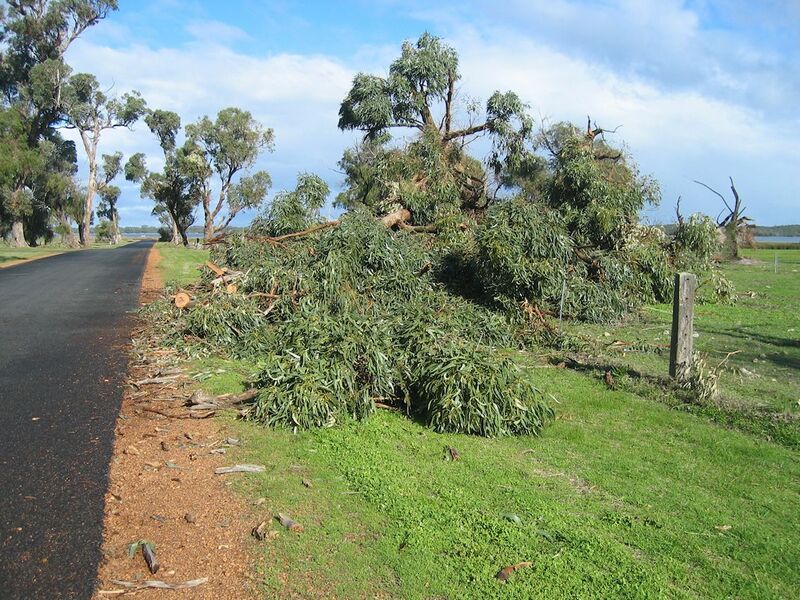 Bunbury City Council is offering a green waste extra verge pickup collection, but the shire I live in isn’t. My shire is offering two extra tip passes, but that requires you to have a trailer or truck to transport the green waste to the tip yourself, and many people don’t have that facility. So they’ll burn the fallen branches. Which means polluted air. Ear plugs are essential for helping me get to sleep on dark and stormy nights. Thank goodness I’ve kept my Qantas-provided ear plugs! Though I think I’ll upgrade to some industrial ones next time I’m in a store that sells them. A spare supply of batteries is essential. Insurance companies have all sorts of ‘gotchas’ in the claims process. 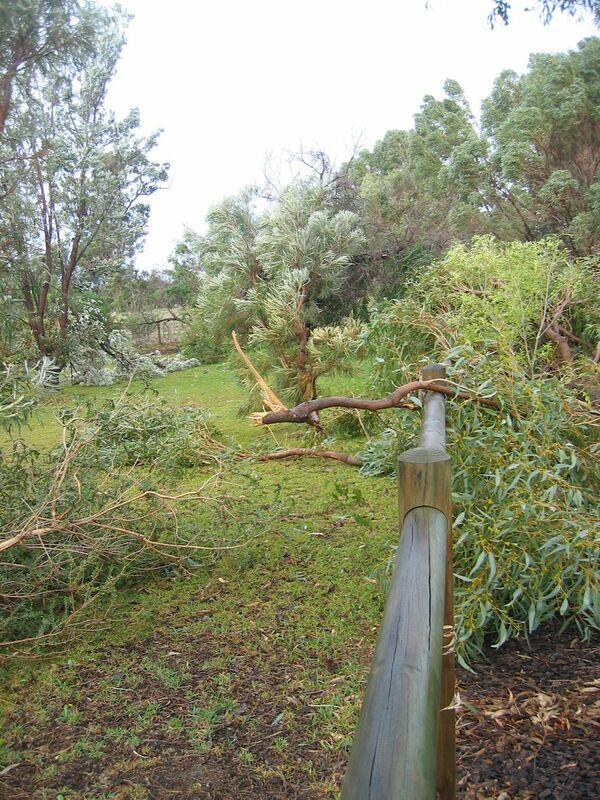 For example, we can’t claim tree removal as a result of the storm unless the fence was damaged (no damage to the fence = no claim). We can’t claim for all the frozen food I threw out as they don’t pay on an extended power outage, only on motor burnout/fusion of the freezer appliance. 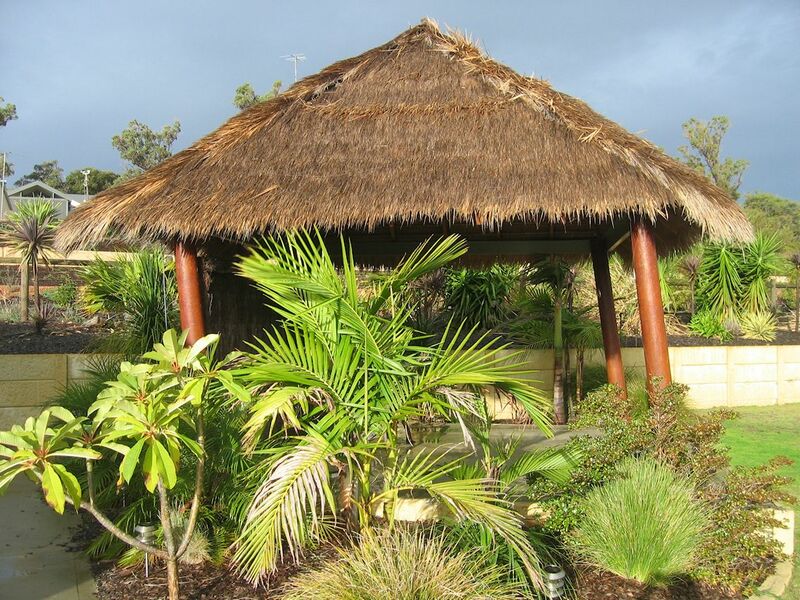 Until the insurance assessor/builder assess the Bali hut in another two weeks, I’m not sure what can be claimed for it or not. Western Power’s $80 ‘compensation’ for a power outage of 12 hours or more is pathetic. $80 won’t pay for the spoiled food I had to toss, and it won’t even make a dent in the money I didn’t earn on Tuesday when I couldn’t work as a result of the power outage the previous two days (I’m a contractor who gets paid by the hour, so if I don’t work, I don’t get paid). However, my situation is just a drop in the ocean. I really feel for the retail businesses, especially those who deal with food. Not only have they lost all their food, but they’ve lost customers either directly as a result of losing power and telecommunications, or indirectly because customers couldn’t get to them or assumed they would be without power too. Some small supermarkets have tossed tens of thousands of dollars worth of food. Had the entire south-west been on underground power, then many of these losses could have been averted. And there wouldn’t have been over 100,000 Western Power customers now claiming compensation. This comes back to lack of will, foresight etc. by political leaders in spending money on decent infrastructure and expecting antiquated systems to last forever. With three or four-year terms for politicians, no-one is prepared to bite the bullet and commit to the massive expenditure required over many years to ‘get it right’. So we’ll continue to have patch jobs done on infrastructure; as a result, this situation WILL occur again. Below are few photos of the destruction in my neighbourhood; there are more photos (with captions) on Flickr: http://www.flickr.com/photos/rhondamadeit/sets/72157630140482016/with/7377753286/. Wow, what a story and what amazing photographs. I’m so glad you made it safely through the storms. What a marathon, 31.5 hours without power. We take it so much for granted. I hope everyone gets things back to normal quickly in your area.